If you would like to help the Sanctuary – there are several ways! Donate – You can make a monetary donation. Event Support – We can always use gift cards or certificates of any kind as well as Chinese Auction Basket Donations. We can always use door prize and food donations at certain events. **We are a federal 501© 3 and donations are tax deductible. Amazon Wish List – We have a Gray Paws Sanctuary Amazon wish list set up! Just search for it on Amazon. We are not brand loyal so you can purchase similar items to the ones on the list. Feel free to purchase anywhere at a better price! 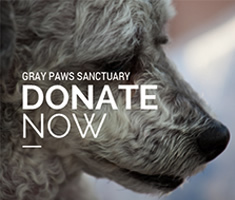 GoodSearch – Select Gray Paws Sanctuary as your charity of choice! go onto GoodSearch.com and register today! GoodShop – same thing! Select Gray Paws! Amazon Smile – same thing! Select Gray Paws! Walk for a Dog App – Sign up and select Gray Paws!